Map depicting surveyed lands, statutory timber lands, land recording divisions, game reserves, communities, bodies of water, and transport routes. Includes inset of McBride townsite. 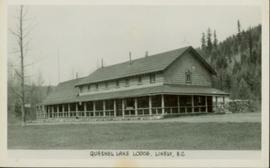 Side perspective of the Quesnel Lake Lodge. The building is in very good condition, and is surrounded by many trees. Printed annotation on recto reads: "Quesnel Lake Lodge, Likely, B.C."